Get all your A-Rod hatin’ right here! Step right up! One stop shopping! Hot off the presses! Last night, the Sox fans in Coors field chanted “Re-sign Lowell! Re-sign Lowell!” as the other premiere free agent third baseman on the market, Mike Lowell, accepted his World Series MVP trophy and walked out on the field to take a gander at his two new hybrid cars. 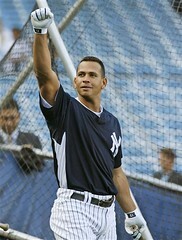 This morning, the Yankee fans from Staten Island to Albany are saying “good bye and good riddance” to A-Rod. Skimming through several papers from the state of New York, I have yet to find one that expresses any sorrow at seeing the back of Alex Rodriguez. “Don’t let the door hit you on the way out!” seems to be the prevailing attitude. If that’s how New York feels about A-Rod, it should come as no surprise that the guys on Boston’s sports radio station were calling A-Rod “a flesh-eating virus.” They saw right through his claim that the “uncertainty” or “turmoil” or whatever you want to call it going on in the Yankees’ front office was the reason he chose last night to opt-out. After all, he had ten days left to think about it—ten days in which the Yanks could have announced their new manager; ten days in which Cashman could have re-signed Pettitte, Rivera, or Posada; and ten days in which the Red Sox could have enjoyed their parade in peace. Speaking of Lester and A-Rod, Mark Kriegel of Fox Sports notes that the timing of A-Rod’s announcement did have some extra irony: “Some years ago, you may recall, the Red Sox were desperate to acquire Rodriguez from the Texas Rangers. The teams agreed on a deal that would have sent Lester, then an outstanding teenage prospect, Manny Ramirez and cash to the Rangers in return for Rodriguez. But the Players Association nixed the deal, saying it could not approve the restructuring of A-Rod’s contract.” I think I can safely say that this is the best deal Theo Epstein made, simply by failing to make it. Not too many people saying that about A-Rod this morning. One day, I really really hope that someone writes a book about Scott Boras and his relationship with clients. Because I just have no idea how much say the players he represents actually has. Would Boras have let A-Rod stay with the Yanks? Did A-Rod instruct Boras to come out with this news during Game 4? Or was it the other way around? It goes against all rationale to let an agent run your life, but more and more, it seems like Boras has that much influence. One of the New York papers I skimmed this morning lambasted A-Rod for not walking away from Boras. Not just because he left the Yankees, but because of the way he handled it. I think there is a serious argument to be made this morning that whatever A-Rod accomplishes henceforth, he will always be remembered as a mercenary, a guy who truly was only in it for himself, who was more concerned with individual records than team wins and who, at the end of the day, wanted cold, hard cash more than anything else. Scott Boras is A-Rod’s employee, and the responsibility for this move ultimately rests with Alex, no matter how much of it was of Scott’s devising.